This quadrant, dedicated to Cosimo de' Medici who was to become Grand Duke of Tuscany only a few years later, bears the calendar and the date 1556 on one face. On the other face is the horary quadrant, calibrated for the latitude of 43? 45' corresponding to Florence. A small head in bas-relief is attached to the centre. 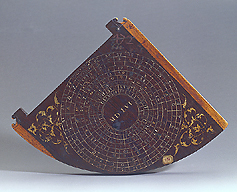 Although the instrument is unsigned, it is attributed to Giovanni Battista Giusti or to the Medicean workshop which produced the measuring instruments for the Grand Ducal collection.